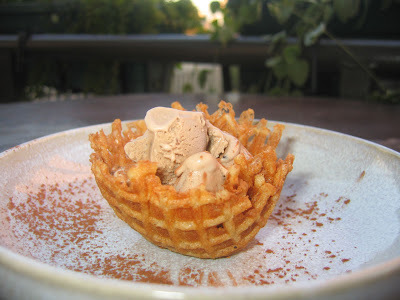 Chocolate and Coffee mixed in an Ice Cream! Yum. I'm not sure anything more needs to be said. It's been mentioned before that I'm completely into ice cream this summer and it appears this obsession is may be carrying into fall. Nothing wrong with that. 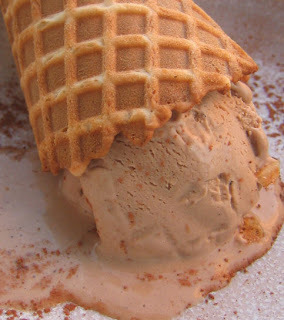 This chocolate coffee ice cream may be taking over as our favorite ice cream so far. It's a perfect ratio of chocolate to coffee and the creaminess is sensational. Like I said earlier, there isn't anything more to say except that it's SUPER FANTASTIC. If you don't try any of my other other great ice creams, at least make this one. It's fat and happy at it's best! Add the cream, milk, cocoa powder, ground coffee, espresso and 1/2 the sugar in a pot whisking everything together. Bring just to below a boil, turn off heat, place a cover on and let steep for about 15 minutes. Then whisk together the yolks and the remaining sugar until the yolks turn a fluffy pale yellow- it's worth the time it takes. Now, temper the eggs by add a cup of the warm cream to the eggs, one cup at a time. This is bringing the eggs up the the temperature of the cream slowly to avoid scrambling the eggs. Place the bowl in a larger bowl of ice and water to cool, stir often. If you need to make the ice cream immediately, add it to your ice cream machine and follow the manufacturers instructions. If you can wait a day, place the cream mixture in the refrigerator for the night, and then continue with the ice cream machine after that. This helps the ice cream to become slightly smoother and creamier!